Are you ready for a FUN and UNIQUE experience? Well here's the answer! 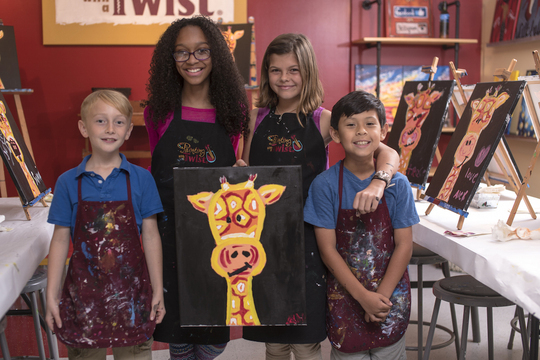 Painting with a Twist is a BYOB art studio! Bring your favorite bottle of wine, beer or other beverage, your favorite food & your favorite people and we'll take care of the rest! 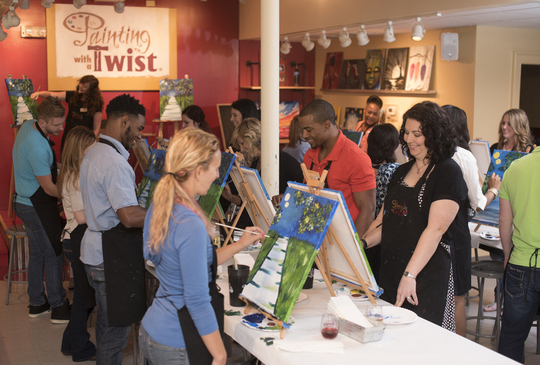 One of our talented artists will be with you every step of the way as you eat, drink and paint your way to a finished work of art. You'll be amazed before the class is over! You might just discover your inner artist! Open Adult Classes, offered Tuesday-Saturday evenings, are fun for you and a friend or small group. Open Kids Classes are offered throughout the month on Saturday and/or Sunday afternoon and when the kids don't have school. Private Parties for adults or kids, offered daily based on availability, are great for groups of ten (10) or more AND you get to pick the art work from a library of over 4,000 paintings. Corporate teambuilding, bachelorette, showers, Girls' Night Out, birthdays and more! I have done two paint classes in the last few months and let me tell you I have ZERO artist skills. I cannot draw. I was lucky to pull C's in art class at school. But yet somehow my paintings look good! The teaching style of the classes walks you through step by step, how to mix the colors, how to paint and where. I love that in the end you have lots of paintings and everyone's looks a little different! If you are looking for a great girls night out, birthday party or really just because it's a Tuesday, I recommend trying out a paint night with some friends! Stay tuned to a future post where I'll grab pictures of my upcoming class! I'd love to hear if you have you attended any paint classes before!! What did you paint? Who did you go with? I know my daughter has been asking for her chance to go with me to one too! I'm not too great at trees though...the next picture I choose hopefully won't include any!